As the weather is turning cooler in our area, I find I am now reaching for a coat not only when I venture outdoors, but even indoors. I have always enjoyed having unique clothing, and crocheted coats are certainly unique, dramatic works of wearable art! These crochet coats are a gorgeous way to add warm layers to your apparel and still feel fashionably dressed. Included in this book, are 3 designs and patterns to crochet a coat. Choose between the Coat of Many Stitches, the Coat of Many Uses and the Coat of Many Colors. They are all beautiful, so either would be a lovely addition to your wardrobe. Not only would these crochet coats be warm, but they are a great way to show the world your crochet skills. 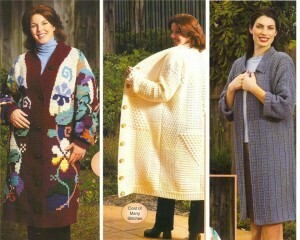 Once you have made you own crocheted coat, you might to wish to make a second coat for a loved one. I know I would appreciate the gift of this kind of treasure. Or, perhaps you would prefer to choose a different pattern and make a second one for yourself. These patterns were not rated by the authors of the book, but my opinion would be that these patterns will require an experienced skill level. I would not recommend these patterns for the beginner, but perhaps the beginner would still enjoy owning the patterns for future use. I know I have collected crochet patterns and books throughout the years. For many of the patterns, I did have the crochet experience or knowledge to make the items right away, but they did give me something to work toward and encouraged me to keep learning and practicing. I love, love, love that coat of many colors. What a bright & cheerful coat it would be to wear on grey, dreary winter days. It would also be fun to crochet as it is so delightful to work with yarn in bright colors! I have crocheted shorter coats before, but never tried a long, beautiful one like these. Now I have new coats to try out. Of course, the Coat of Many Colors is gorgeous, but I would love to try my crochet hand at the Coat of Many Stitches. WOW, these are crocheted coats are gorgeous! I don’t think I have ever seen one. It’s way past my knowledge of crocheting but I bet Elf, Susan and you could all have beautiful coats of many colors!